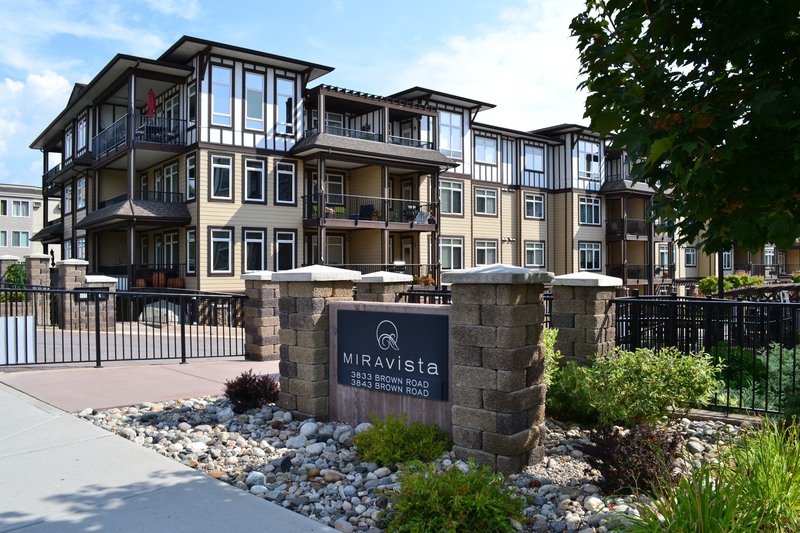 Miravista, a community located on Kelowna’s Westside, is home to 224 condominiums spread amongst four, four-storey buildings. Many homes at Miravista enjoy expansive views from their balconies including the scenic Mission Hill Winery and across Okanagan Lake looking towards Kelowna’s downtown and Knox Mountain. On-site amenities include a guest suite, an outdoor pool and hot tub, recreation and a common room. Miravista features a welcoming and informative community website, perhaps reflecting the care of its strata, with answers to many frequently asked questions. West Kelowna is home to beaches, wineries, golf courses, hiking trails, shops and services. Within walking distance of Miravista is Starbucks, Save On Foods, Shoppers Drug Mart (to name only a few) and Johnson Bentley Aquatic Centre. And, with Highway 97 as its main thoroughfare, access North to Kelowna or South to Peachland, Summerland, or Penticton, is incredibly convenient. Rentals are permitted and pets (1 cat or 1 dog with a maximum height of 18”) is permitted. As rules and regulations change over time, please contact me for the most up-to-date information.